I “met” Tamar over the summer when a friend of mine commented on a photo of hers and it showed up on my facebook feed. Besides the fact that it’s a bit creepy how facebook seems to know me, I am very glad that this meeting happened! The name of her album was so wonderful that I just had to add her as a friend. The album was entitled “Tichels Are Cool” and was filled with various photos of her showing her experimentations and gorgeous wraps… definitely meant to be. Here she is as this week’s Lady Wrap Star! My name’s Tamar Goldschmidt and I live in the heart of Jerusalem, the grooviest place in the world! I moved here almost 3 years ago, met my husband and now have an amazing little baby boy, Shlomo Nachman B”H…I’m currently studying to be a doula and besides my typical hobbies, including writing, art, reading, analyzing poetry, being a mommy and an orthodox jew with the funk etc – I continuously try to discover new tichel ideas! As a married Jewish woman, it is our job to officially rock! Where did you learn how to wrap scarves? I taught myself at around 12 or 13 when I began collecting them. I always knew I was going to cover my hair. I felt so connected to the idea of making something so normal so spiritual and special in a marriage. And since growing up, my dream occupation was to be a wife and mother (with a few novels up my sleeve as well) the idea of covering my hair was something i could identify with. What tichel wrapping advice/secrets do you have to share with us? Two words that are so essential they have to be typed in caps: TICHEL BAND…You can get your beauty sleep while wearing the craziest and heaviest tichel ever and it wont move an inch off your head! You can find it in any tichel shop! Are there any specific ideas that you would like to share about what you have learned about covering based on your face shape, colouring, style, etc.? Do you have a favourite style of wrapping? I take pride in my princess-do…and my beehive-do…In short, it’s difficult to choose. I guess it depends what I’m feeling that day. Most vivid tichel wearing memory? What do you love most about covering your hair? I LOVE walking down the street, passing other married women and seeing different styles of tichel wrapping. There was a few times where someone’s tichel caught my eye and they were thinking the same thing about mine…I can’t tell you how many times tichels have been number one conversation starters. I’m grateful for having been given the opportunity to be featured on Wrapunzel! I loved this post!! Tamar seems like a very cool girl. I’m also itching for a tutorial about the princess thing. Perhaps when we’re in Jerusalem this summer I will track her down and do a video of her! Search for “grip comfort band” and number of sites should pop up! And if she weren’t studying to be a doula, I would think that I DO know her. Tamar is one of my best friends and she is an AMAZING girl! She taught me the princess wrap and it seriously changed my ticheling! I’m so proud of you, ‘Mar!! Wow! You are the first person I’ve seen with the name “Tahara” – besides my daughter! I absolutely LOVE this interview. 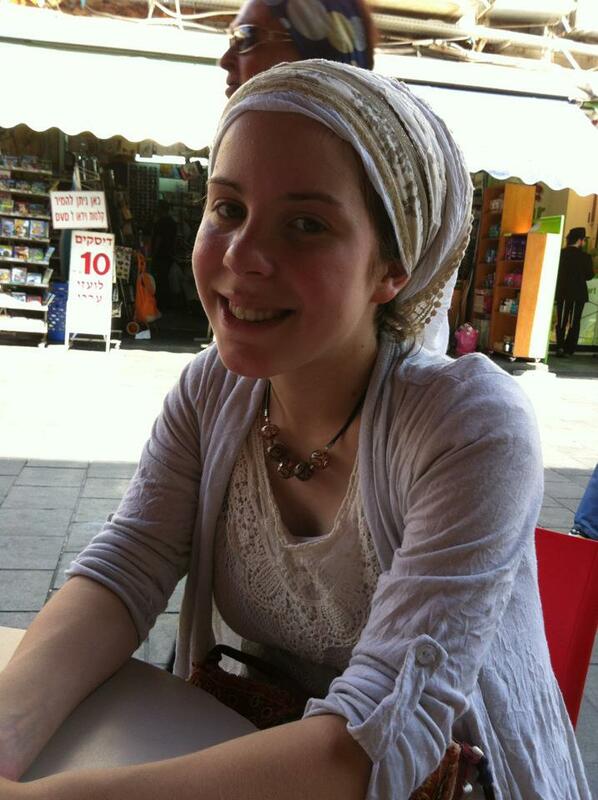 Tamar is a young woman that I had the privilege of having in my life before she moved to Eretz Yisrael. She is beautiful inside and out and I am blown away by her love of Torah and life. Kol Hakavod for having her spotlighted and YES, we need videos of how she puts all those wraps around her brilliant head! Yes please! Would love to see her tutorial on her favorite tichel styles. I really like the first one that Tamar is wearing. Yes, I would love to see a tutorial from Tamar! Oh my, I thought she was a teenager at first…! Which one form her pictures is the princess do? Andrea, you chose well when you chose Tamar as this week’s “Wrap Star”. I first noticed Tamar and her husband as standouts at my daughter’s wedding – other than the beautiful bride and groom, of course! They clearly had a style all their own and it was amazing. I remember thinking that Tamar’s tichel made her look like a queen, unlike many other hair coverings. It was so different, big, beautiful, crowning and it draped over her shoulder. It and she were amazingly elegant! Tamar has been very generous is sharing her amazing skills with her friends, who, in addition to Tamar are followers of your blog! Do you think you could ask Tamar to film herself demonstrating the Beehive and Princess do’s? I would love to see it. Or would you show us how? Thank you.